It’s official. I am officially a fan of the Saw franchise. I don’t know what this series awakens in me. It’s probably playing to my teenage love of crime dramas, as well as the highly under-developed dark side that was fascinated by serial killers. Those two parts of me emerged around the same time, unsurprisingly. 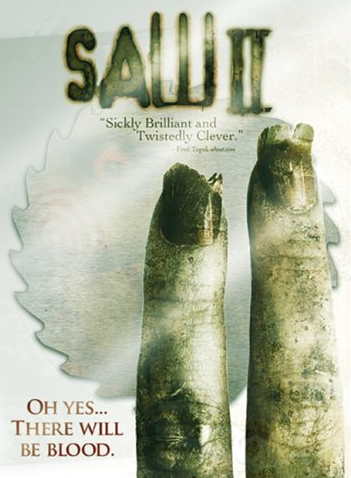 The gist: Saw II opens with a group of strangers waking in a house, unaware of how they got there or why. But among them are the son of police detective Eric Matthews and Amanda Young, the only recorded “winner” of a Jigsaw trap. The group soon realizes that they have to work together to get out of this situation alive. On the outside, Eric is questioning Jigsaw and trying to pry any further information out of him. We finally learn why Jigsaw does what he does: Under the thumb of terminal cancer, he attempted to commit suicide. When his attempt failed, he gained a newfound appreciation for life. But it soon became clear how few people truly appreciate their lives, and how few people would ever have the opportunity to learn such a lesson. Thus began the legacy of Jigsaw: Teach people the meaning of life by setting them in situations where they must actively choose between it and death. What I “learned”: The most difficult thing in a movie is maintaining just the right level of empathy for the “victim” characters. Too much, and you have a gut-wrencher no one will go to see. Too little, and you have nothing to watch. Unfortunately, this movie turned out to be the latter. I was given too many people to care about in too short of a time, with no discernment about who was higher and lower priority to the plot. Does that sound callous? Yes, it does. But that’s how horror movies work. I was lucky in that I ended up caring about Amanda, who ended up being important in ways that verge into spoiler territory. But I had misplaced my interest in Obi, the drug addict who helped Jigsaw kidnap everyone and was now trapped in the house with him. He was barely being consequential, and I was made to care about him. That, ideally, should not happen. See this movie if you like: Horror franchises. I thoroughly did not care enough about the people involved in this movie enough to be fully invested in their plight. But it’s so essential to see this movie in the series if one is to fully understand Jigsaw and all that he does. It’s a necessary “middle child” film. Proceed with caution. Avoid this movie if: You need your horror movie “kills” to be somewhat based in reality. There are definitely a few scenes in this movie where someone should have died, or would most likely have. It requires such a leap of imagination that I would be loathe to recommend this movie even to fans of the first. You’re better off reading a summary of the high points of this one and going on to Saw III.